Our large dog Halloween costumes are great for big dogs. They are adorable and will make your dog's Halloween special. 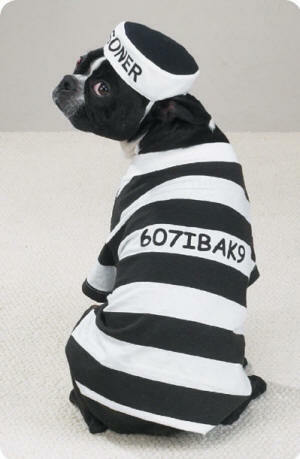 Some Sizes May Not Be Back In Stock Until Sept.
Two-piece costume comes complete with prisoner hat and shirt with bars and “K9INM8” printed on the front. Pullover style shirt is easy to put on and comfy to wear since it’s made with soft poly-cotton blend. Prisoner hat comes with elastic chin strap, adjustable toggle and ear loops for a secure, snug fit. Lightweight fabric is perfect for dogs and cats alike, and comes in various sizes so you can find the right fit. It’s a go-to costume for Halloween, themed parties or photo shoots, and is perfect for matching costume ideas—like warden and prisoner! Made of 100% polyester camouflage material with a naturalistic shimmer sheen effect and stuffed for a 3-D look. Easy to put on and ultra-wearable with touch fastener and belly straps; costume “sits” on your dog’s back so he can move about freely and comfortably. Includes a built-in leash hole so you can easily access his harness when you’re ready to go trick-or-treating. Great for Halloween parties, themed events and photoshoots, and can spark up paired costume ideas like an alligator wrestler, wilderness guide, or Captain Hook. It’s machine-washable so you can easily keep it clean with no messes or hassles, even after a night out on the swamp. Precautions Supervision is recommended while your pet is wearing this garment. Pets will be spellbound by this adorable polyester satin costume that includes a matching hat and plush broom toy with squeaker. Features orange sequins and a lace-up back with Velcro closures at the neck and belly. Blue shirt-style costume with matching hat and black belt with radio and handcuffs​. Your pet can join the Dark Side as everyone's favorite Sith Lord in the officially licensed Star Wars Darth Vader Pet Costume. Lightweight and comfortable, this outfit features a shirt with designs based on Vader's suit, a detachable cape and a headpiece designed to look like Vader's helmet. Contains a shirt, detachable cape, and headpiece. Out gorgeous black satin flapper dog dress is trimmed with gold sequins around waist, neckline and on the bodice with a fringed skirt. Perfect for small and big dogs. Handmade. Allow 1 week to ship. Adorable skunk costume comes complete with furry tail and white fur line down the back. Made of soft polyester for added comfort, and features cute pink ears for an extra dose of cuteness. Easy to put on and wear thanks to the hoodie design that’s perfect for cats and dogs alike, with Velcro neck and belly straps so it stays on securely. The hood has a built-in elastic trim that helps keep it in place for added wear- ability. Perfect for Halloween, themed parties or photo shoots and is available in various sizes. Plush shark costume comes complete with white felt teeth, embroidered eyes, and plush-filled fins. Soft and comfy to wear, and designed to be easy to put on for dogs and cats alike. Velcro straps around the neck and belly ensure a secure, snug fit that stays on while your pal trick-or-treats. Built-in leash hole so you can attach a leash to a collar worn underneath the costume. Available in various sizes so you can find the right fit for your pal. Perfect for any Halloween party or Jaws-themed outing. For the best fit, please be sure to measure your dog carefully before selecting a size. 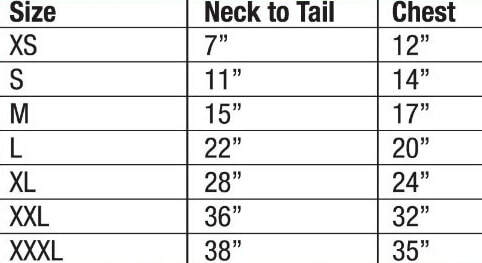 The sizing chart image provides exact measurements by size and general recommendations by breed. For pet use only. Intended for supervised use under short periods of time. Do not allow your pet to chew on the product. Small parts may present a choking hazard. 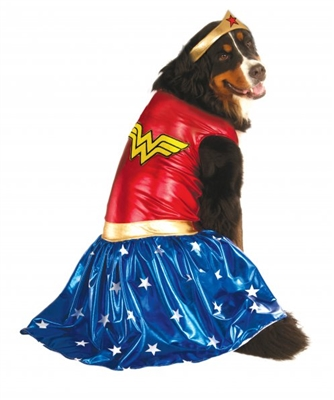 A great costume for Therapy dogs, Halloween or any care-giver who gives joy and comfort to two-legged creatures. The dress and hat are made of easy care cotton with cotton lining for your pet's comfort. A red heart and white cross are appliqued on the dress and hat. The dress closes at the neck and waist with sturdy Velcro. Nurses costume has a red tulle underlay. The matching hat secures with ribbon ties. The matching hat is included. Perfect for parades and parties. Earline: Measure The top of the head, the distance between your dog's ears. Bone Viking is a costume in itself. 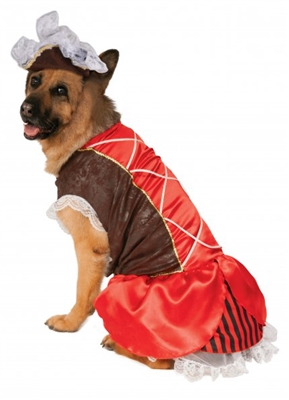 This costume can fit many different size dogs as it is available in four sizes. It is a hat (adjustable Velcro strap) without a bodysuit. It is made with plush furry fabric for the headpiece & the horns and bone are filled with stuffing to keep them firm and standing up. ​Now your favorite four-legged member of the family can join the fun. 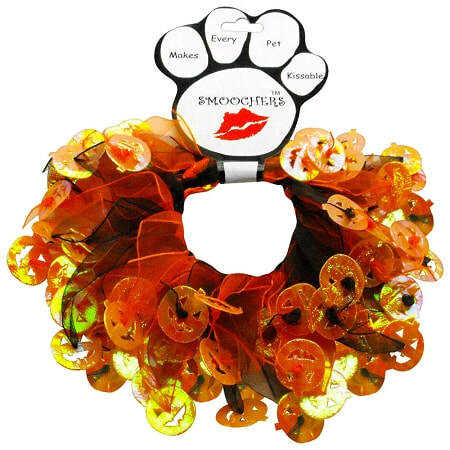 Your dogs will be ready for parades, parties, or just having fun. 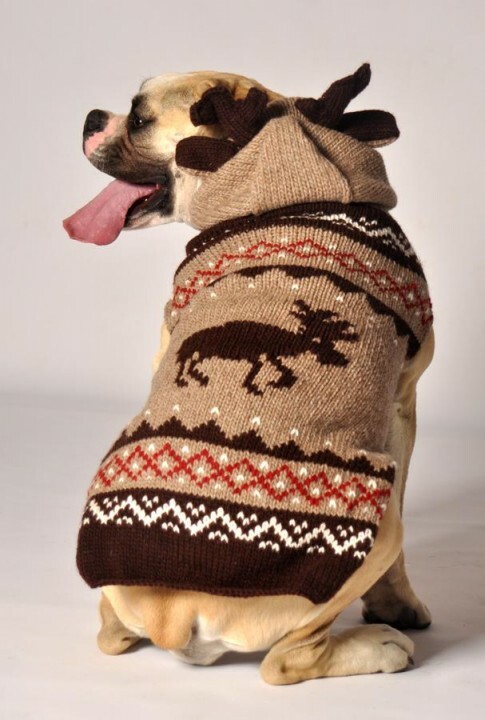 Moosey Hoodie Dog Sweater are made following the Fair Trade guidelines. All sweaters are wool and handmade & may vary slightly in color & style. Bunny Dog Sweater are made following the Fair Trade guidelines. All sweaters are wool and handmade & may vary slightly in color & style. Treat your dog to these irresistibly cute Pet Costumes. They dress up any pet to turn any occasion into a humorous photo opportunity. Perfect for the pooch on the lam. The Prison Pooch is made of woven polyester secured with Velcro bands at neck and stomach. Includes a soft, Black & White Prison Cap to frame your pooches guilty face. Your pet can aid the Rebellion on Endor in the officially licensed Star Wars Ewok Pet Costume.Lightweight and comfortable, this outfit features a shirt with attached foot covers and a matching hood to mimic the cute but deadly natives of the Forest Moon. Now your favorite four-legged member of the family can join the fun. Your dogs will be ready for parades, parties, or just having fun. Monkey Dog Sweater are made following the Fair Trade guidelines. All sweaters are wool and handmade & may vary slightly in color & style. Adorably spooky, hoodie style skeleton costume comes complete with glow-in-the-dark skeleton detail. Made of plush, soft polyester so it’s comfy to wear for dogs and cats alike. The design actually glows in the dark! 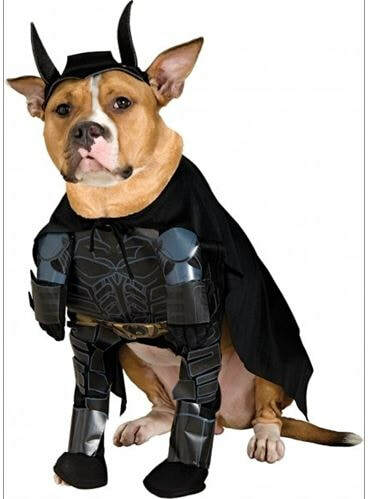 Features a built-in leash hole so you can always have access to your pal’s collar underneath the costume. Easy to put on with a pull-over hoodie design and Velcro belly strap. Available in different sizes so you can find the right fit for your pet. It’s a go-to costume for Halloween, themed parties or photo shoots. Let pets take part in the wedding day celebration! This exquisite white satin bride dress for dogs includes a coordinating headpiece with an adjustable, easy fit strap. A stunningly detailed dress for the doggie bride-to-be. White satin dress features ruffled trim, a skirt with an elegant organza overlay, and a large satin bow on the back. Coordinating headpiece features an organza veil and a satin bow. Headpiece has an elasticized chinstrap for easy attachment. Willie Coyote is on the chase! 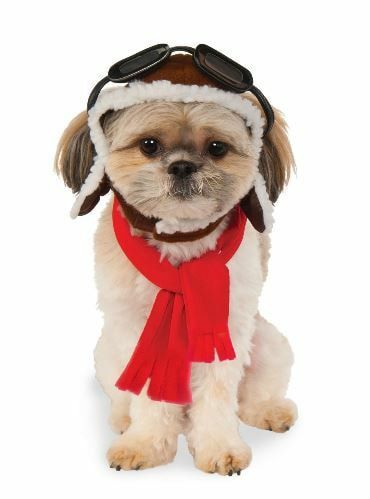 With adjustable Velcro harness on belly and chest for an accurate take off and landing this costume is guaranteed to get lots of laughs. Made for larger dogs up to any size. Easy to wear and easy to laugh. Size Small : Rocket Length is 7" long, Chest size 10"-12". Size Medium : Rocket Length is 10" long Chest size 12"-16". Size large : Rocket Length is 12 1/2" long, Chest size is 16"-21" Size XL : Rocket Length is 13 1/2" long, Chest size is 21" - 32 "
Your pet can dress like the mischievous little droid in the officially licensed Star Wars R2-D2 Pet Costume. Lightweight and comfortable, this outfit features a shirt with attached foot covers and a matching hat to mimic the iconic droid of Star Wars. Contains a shirt and hat. Our All Time Favorite " High End" Dog Tuxedo is one of the Best Tuxedos on the Market! D-Ring, larger sizes have a button hole for a leash to pass through. easy washing or wearing by itself. Tuxedo set is hand wash - line dry.